Michael Carrick will start Manchester United final game of the season at Old Trafford confirmed Jose Mourinho. Carrick will take up a coaching role in United when he retired at the end the end of the season. 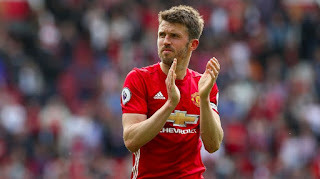 Michael Carrick has been in Manchester United for 12 years and the match against Watford will be his last for the club before he takes up his role as a coach. Manchester United will greatly miss Michael Carrick when he finally retires at the end of the season.